Buzzards are medium-sized raptors with unfeathered lower legs. 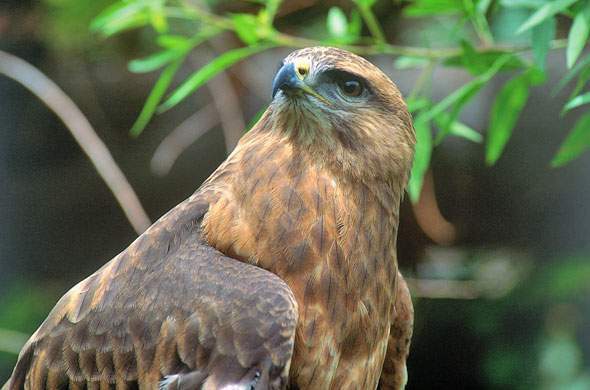 The Steppe Buzzard is the most commonly seen buzzard in Kruger, while there is scepticism that the Jackal Buzzard should be classified as a Kruger bird at all as it is rarely seen in the Park. Peter Steyn quips that the Steppe Buzzard should be called the 'fingerprint buzzard' because no two birds are exactly alike. It breeds in the Russian Steppes and although it is usually a solitary bird, it flies south in groups of up to 100, following the escarpment and Lebombo mountain range into South Africa. Their arrival in Kruger usually coincides with the first summer rains. It is a strong flier, although it usually hunts from the perch, where it can sit for hours looking for prey. When it spots something, it descends in a smooth glide to catch it. Mostly silent. Varies from light brown to almost black; whitish secondary wing feathers; streaked underparts and barred flanks. Where best to find them: Prefers more open areas such as the eastern grasslands. The Jackal Buzzard is more of an escarpment than a lowveld bird, although there have been irregular sightings in the south-western foothills. It soars high on thermals but most of its hunting is usually done from a perch. It is very vocal during its winter breeding period and frequently emits a high-pitched yelping cry similar to that of the black-backed jackal. Females have a deeper voice than males. Adults appear to be more sedentary than juveniles, which seem to wander far. Cainism occurs in the nest when the first-born hatchling attacks the second-born, but they are not always killed as is the case with some of the larger raptors. Distinct rufous chest and tail feathers; white-and-black underwings; black-and-white barred belly. Small rodents and mammals, reptiles, insects and carrion; other birds up to the size of a francolin. South-western foothills around Berg-en-Dal and occasionally around Pretoriuskop outcrops; rare sightings in the Lebombo. The Lizard Buzzard is not a regular sighting, although Roberts VII estimates there is a healthy population of about 500 birds in the Park. It prefers the higher rainfall areas of the north-west and south-west where it spends a lot of time perching conspicuously in trees looking for prey. True to its name, it eats mostly lizards as well as small snakes, rodents and insects. It is generally silent, singing mainly in breeding season when perched, and calling for a long time. Mostly grey with stripes across belly; very noticeable vertical black stripe on throat; stocky, plump build; two white bands on the tail in flight. Lizards, insects, small snakes and rodents; small mammals; occasionally other birds. Mopane and other woodland where this habitat overlaps with riverine forest; regularly seen near Phabeni Gate and around the upper Sabie River.